This Struts 2 tutorials will explain how to fetch data from MySQL database using struts 2. In this demo, we are going to use Java Collection List to store all the data and display the collection of data using Struts 2 iterator tag. index.jps for invoking the action and display the records. 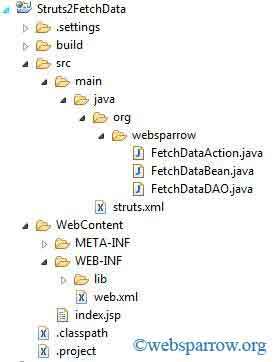 FetchDataAction.java for storing the incoming data in List. FetchDataDAO.java for connecting with the database and retrieve the data. web.xml used for defining the filter and welcome page. struts.xml used for defining the action and result. Note this demo has been designed on MVC Architecture. To use Struts 2, we need the Struts core jars and MySQL connector jar. To download Struts jars click here. Before starting the code we need define struts 2 filter in web.xml. Create the DAO and Bean class that communicates with the database and retrieve the data from the table. Action class contains ArrayList object as the data member and execute method. Now create the page that interacts with the user. For the test, the application hit this URL in your browser http://localhost:8080/Struts2FetchData/. We will get an output as given below.